The AETEFEKA company presents ABBAL, a musical trip throughout Southern Italy’s traditional music. 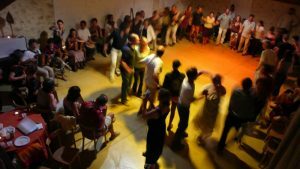 An ageless repertoire : songs, dances, serenades, drinking and all-night dancing music, from Naples and Campania, through Puglia, Calabria, and to Sicily. The use of traditional instruments, wild rythms and soulful voices bring the audience into the «magic circle». A symbol of unity, an initiatory moment, an allegory of the infinite present, a place of trance, matter and spirit : the circle of life. dans le «cercle magique» symbole d’union, moment initiatique, repré- sentation de l’infini présent, espace de transe, matière et esprit : cercle de vie.